Like any discursive phenomenon, categories of cultural distinction (such as “high” art, “low” culture, or the less well-researched area of the “middlebrow”) require the substrate of some medium or medial field—be it language, mass media, or new media—in order to articulate the differences upon which they turn. Cultural clout or capital, for example, is accumulated, and the conditions of such accumulation are defined and regulated, in media ranging from the popular press to specialized academic and legal treatises. At the same time, the categories of cultural distinction not only take shape within media but apply as well to concrete media and media products. Individual novels, films, and music productions are classed according to oppositions such as high vs. low, art vs. kitsch, quality vs. trash, mainstream vs. alternative, while at times whole media are more generally relegated to a lowly status (such as was the case with “primitive” or pre-classical cinema or with the videogame in the eyes of many today) or, on the other hand, accorded a higher one (e.g. the “graphic novel” vis-à-vis the pulpy comics from which it evolved). Clearly, these examples attest to the fact that cultural distinctions are negotiable and historically indexed, but more importantly, they point to the role of media transformations in the historical revision and renegotiation of distinction categories. Notions of film-as-art, for example, first emerge (in the film-aesthetic writings of Vachel Lindsay and Hugo Münsterberg) in the 1910s, amidst the sweeping and uncertain changes of the “transitional era” between early and classical cinema, and the aesthetic revalorization of the popular medium finds its most pronounced expression (with the likes of Rudolf Arnheim) in the wake of the film-technological transition from silent to sound cinema. Similarly, the rise of so-called “Quality TV” takes place at a highly overdetermined moment of media change, one marked by digitalization, convergence trajectories, the rise of alternative delivery media, and a general reorganization of the televisual landscape. 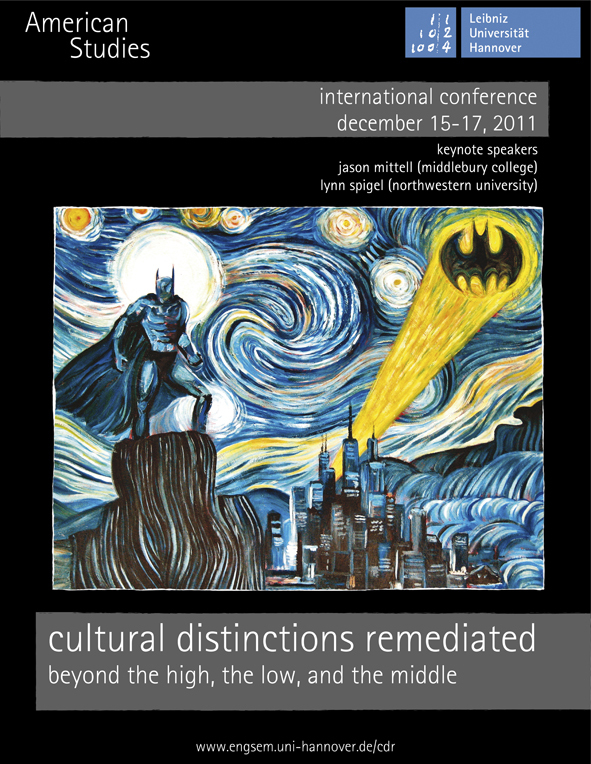 The conference “Cultural Distinctions Remediated: Beyond the High, the Low, and the Middle” aims to shed light on such processes of transformation, in which the medial “double articulation” of distinction categories—i.e. the fact that they are both articulated in media and apply to media—is most crucially at stake, by looking critically at what happens when existing media and attendant categories are “remediated” by newer ones: How are categories of cultural distinction transformed, or how do they relate to a transformed media landscape? These questions will be pursued across a wide range of media and from comparative (both cross-medial and historical) perspectives. This entry was posted in Conferences, Hannover and tagged conference, cultural distinctions remediated, Leibniz Uni Hannover. Bookmark the permalink.